Welcome to the third of the Oktoberfest review fest. 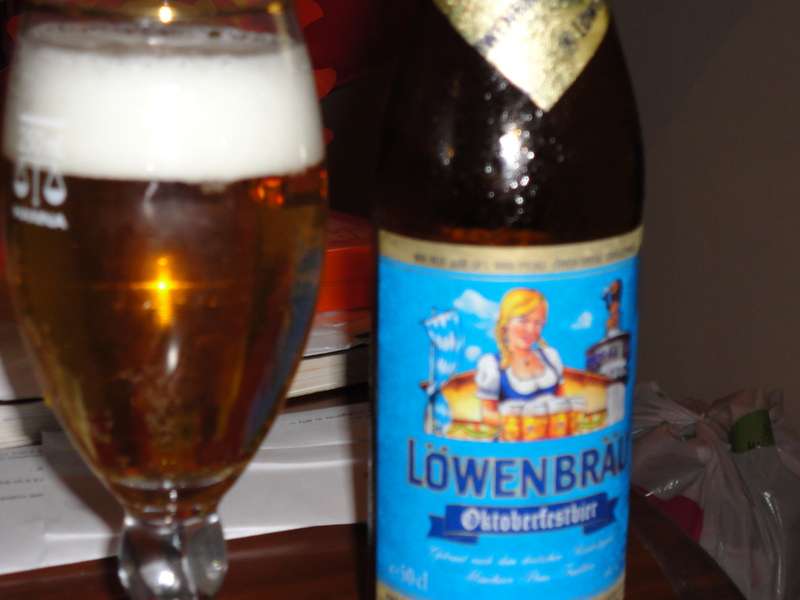 Tonight we look at a familiar name in the brewing world, Lowenbrau. It is familiar because it is now owned by brewing tyrant, Anheuser-Busch InBev. There are other reasons you would have stumbled across it’s path though, it is one of the six breweries allowed to peddle their product at the Oktoberfest celebrations in Munich and have been doing so since 1810, ironically the Oktoberfest Bier is not the beer that Lowenbrau sell at the famous fest, rather they make a Wiesenbier. Anyway onward to a review. For the first time in this series I have been impressed by the head that was poured out of this bottle. It was pure white and fluffy. It looked like a cloud over a land of golden pee, that didn’t sound as good as I meant it to be, o well. The critical part came next, tasting it! I imagine it was the beer equivalent to being stood up on the second date after you had a really good first one. One second it was there and going okay, the next it was gone, slinking away. (I did think about using a one night stand analogy but didn’t want to descend to that level) maybe it’s more like your date sliding out the bathroom dinner half way through the entrée. thats better yes lets run with that. This Oktoberfest started with a hit of malty and ended with a bit of bitterness coming from the hops. All up it was easy to drink but less then memorable and a little oily taste was left in my mouth with a touch of bitterness. Maybe this beer was just like a bad first date.